A classic small Tjalk of riveted construction. Electrical installation renewed in 2009. Heating by electric radiators. Hot water by electric &/or engine heat exchanger. 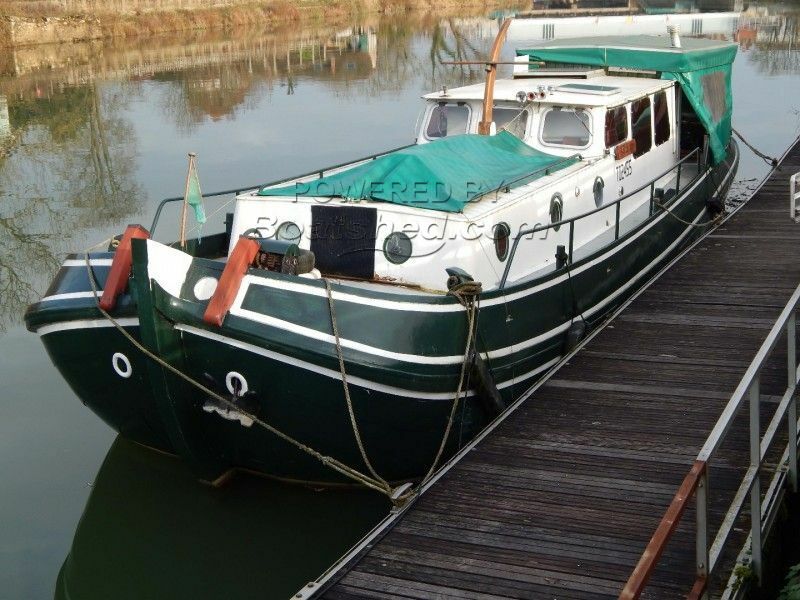 Dutch barge Tjalk for sale by Boatshed Bourgogne. We are please to propose this little Tjalk for sale in Burgundy, a large convivial aft deck and lots of potential for this classic tjalk conversion currently used as a live-aboard. Has not cruised for two season and now for sale due to ill health this is an ideal size vessel for relaxed cruising of all inland waterways and hassle free admission to marina berths. Take a look at the photos and just imagine what you could do to it. This Dutch Tjalk Live Aboard/bateau Logement has been personally photographed and viewed by graham wharmby of Boatshed Bourgogne. Click here for contact details.